More 3D content is on the way for you “early adaptors” to enjoy. The 3D joint venture between Sony Corporation, Discovery Communications and IMAX Corporation is adding six new 3D titles, three of which are original series produced in native 3D format for the upcoming 24/7 3D television network scheduled to launch in early 2011. Cowboys live their lives 8 seconds at a time, but the men sent in to save them from harm face up to 90 2,000-pound angry bulls a night. This series brings to life the most extreme and dangerous man-versus-beast competition in existence – the daredevil world of professional bull riding – focusing on the true heroes of the sport. Produced by Wild Eyes Productions and Digital Revolution Studios. Utilizing the latest evolution in 3D camera equipment and cutting-edge production techniques, this series brings viewers along for the ride in the high-octane worlds of motocross, jet skiing, rock-climbing, bungee jumping and other extreme action sports in a way only native 3D can. Produced by Electric Sky Productions. From sophisticated machinery designed to produce goods with mind-numbing efficiency and speed, to the artistry and craftsmanship of human creativity, the diverse and fascinating world of how products are produced on a mass scale is brought to life in this hour-long, native 3D series. Produced by Electric Sky Productions. Join Brad and Barry Klinge, founders of investigative group Everyday Paranormal, as they travel the U.S. using some of the world’s most sophisticated equipment to gather powerful supernatural research. This native 3D one-hour special brings an entirely new dimension to the long-running hit series seen regularly on the Discovery Channel. Produced by Paper Route Productions and Go Go Luckey Entertainment. 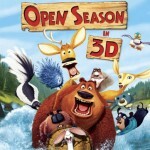 The first feature-length animated film from Sony Pictures Animation features Boog (Martin Lawrence), a happily domesticated grizzly bear, who has his perfect world turned upside down after he meets Elliot (Ashton Kutcher), a scrawny, fast-talking wild mule deer. This special event will transport viewers 220 miles above the Earth at 17,500 mph to experience the greatest engineering feat since mankind walked on the moon. “Space Station,” the world’s first ever 3D journey into space, is narrated by Tom Cruise.